In addition to the basic tasks needed to create lists and review words, Kanji Go also includes a series of specialized tools, available from the Tool menu. These tools are designed to expedite things that, while do-able manually, would be overly time consuming. 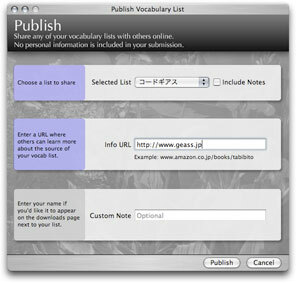 Publishing Vocab Lists: Once you've created a vocab list for class, novel, film, etc, you can share your list with others using the Publish feature. Lists submitted via this tool appear on the vocab lists download page. To publish a list, follow the steps below. Enter a URL where others can learn more about the source of your list- be it a book, movie, game, newspaper, or just everyday conversation. Optionally, you can also enter in a note (if you type your name, you'll be credited on the download page). Click submit- as long as you have an internet connection, the list should be sent instantly to ftp.redkitsune.org. You should see it online within 24 hours. Build Kanji Vocab List: If you've already created a list of words, but want to specifically learn its Kanji, this tool will let you quickly create a Kanji Study list. The new list it creates will have the same name as your old list, but start with 'Kanji:'. To build a Kanji Vocab list, follow the steps below. 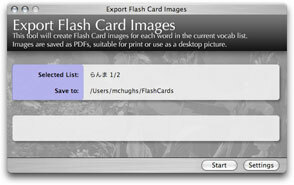 Export Flash Card Images: If you'd like to use Flash cards as your background picture, view them in a slide show format, or print out large/high resolution flash cards, this tool will help you by creating PDF images for each word in a vocab list. To Create PDF images, follow the steps below. 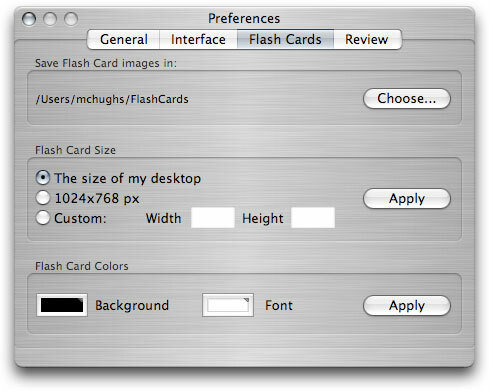 Optional: Click Settings to open Preferences and adjust the size/colors of the exported images. When done, hit Apply and close Preferences. Click Start- a progress bar will be shown. The images will be saved to the location shown next to 'Save to:'. By default, this is in a folder called Flash Cards in your home folder.